Hey everyone! Travis back with a reminder about some Tampa Bay entertainment you don&apos;t want to miss. 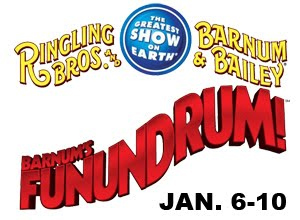 We are doing a giveaway for 2 tickets to see Ringling Bros. and Barnum & Bailey Circus at the St. Pete Times Forum in January. Just click here for info on the show. The giveaway is tomorrow at 10am on the Visit Tampa Bay Facebook fan page, so log on now and become a fan - www.facebook.com/visittampabay. As always, we&apos;ll post a trivia question, and the first 10 correct responses have a chance to win the tickets. I&apos;ll see everyone tomorrow for a great contest! And, keep checking back here for more great things to do in Tampa Bay, Tampa Florida News, and cool Tampa Bay area events for the holidays.